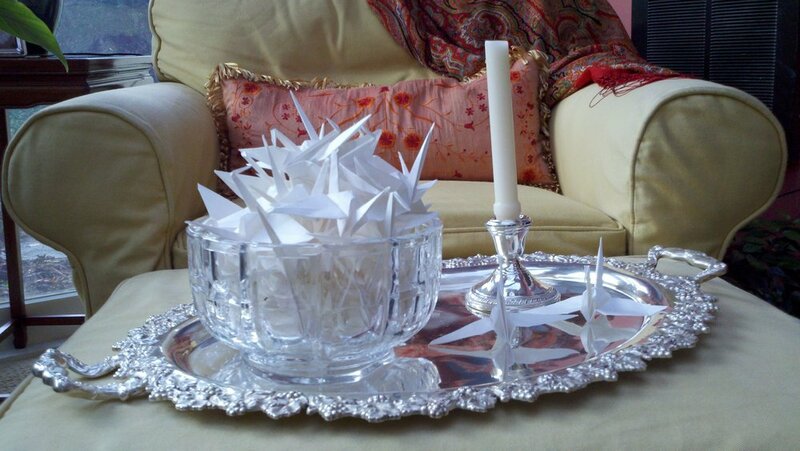 A crystal bowl full of white origami cranes sitting on a foyer or coffee table is a simple way to add a special touch to any room in your home. One of the most famous origami designs is the Japanese crane. The Japanese word origami comes from two words (“ori”, meaning to fold, and “kami”, meaning paper.) Like many things in Japanese culture, origami has its origins in China. The earliest records of origami in Japan date back to 794 – 1185 in the Heian Period. During this golden age paper was a rare commodity, so origami was a pastime of the affluent upper classes and the nobility. It wasn’t until the Edo Period (1600-1868) that it became popular with the common and merchant classes. By the mid-19th century, 70 or more different designs have been created and become widely used. As a result of this rich history, the crane design is considered auspicious in Japanese culture. The crane is a symbol of honor, peace, courage, and loyalty. It is a majestic, graceful bird which mates for life and is an extremely loyal partner. Legend says that anyone who folds 1,000 cranes will be granted his or her greatest wish. The origami crane has become an international symbol of peace because of this legend and the story of Sadako Sasaki. As an infant, Sadako was exposed to radiation when the atomic bomb was dropped on Hiroshima. At age 11, she was diagnosed with Leukemia and told that her prognosis was poor and that she did not have long to live. The story goes that her best friend shared the old Japanese legend of folding 1,000 cranes with her. Hearing about the legend, Sadako decided to fold 1000 cranes so she could live. However, when she saw other children in the hospital with Leukemia dying, she realized that she was not going to survive and instead wished for world peace. Unfortunately, Sadako died in her sleep when she was 12 after completing 644 cranes. After her death, her friends decided to complete the 356 remaining paper cranes. Sadako was buried with these 1000 paper cranes to honor her dream of world peace. Her story of courage and compassion inspired her peers and family friends to create a large granite statue of Sadako Sasaki in the middle of the Hiroshima Peace Park. The statue depicts a girl standing with her arms open wide with a paper crane flying from her fingertips. Every day the memorial is said to be covered with paper cranes in the hope of world peace. This is why when I see a bowl full of simple, white cranes sitting on a table in my home, I think of peace, hope, courage, love, and loyalty. Origami cranes are relatively easy to make or they can be ordered online already folded and ready to use. Go ahead pull out a crystal bowl and fill it up with beautiful, peaceful cranes.